I do love my comics, ever since my early days of Twinkle and Bunty. As I grew older they became slightly geekier, and I must admit I have some old copies of the Silver Surfer and *cringe* Buffy lying around. Add to those a couple of graphic novels and AXA comics (borrowed from my Dad) and if I wasn’t blonde I’d be 100% geeky. So it’s quite unusual that Diane Von Furstenberg, doyenne of the fashion industry has put her name to a comic. She’s helped launch the new Wonderwoman comic with DC comics, and tied this in with her new superhero clothing line (think stars and fireworks). The comic is titled ‘Be the Wonder Woman You Can Be, Featuring the Adventures of Diva, Viva & Fifa’, and follows their adventures. 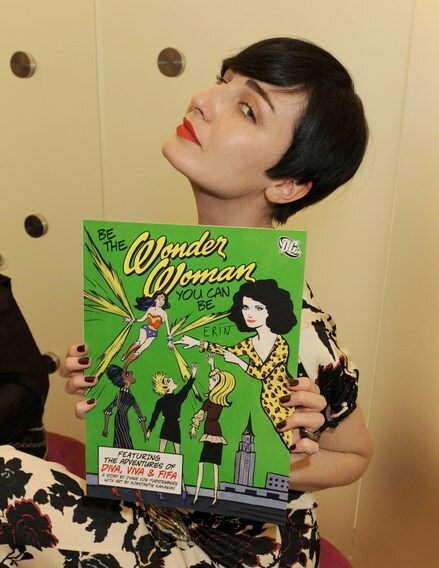 All profits go to charity and model of the moment Erin O Connor is shown proudly displaying her copy above. Gail Simone’s run writing Wonder Woman has been pretty good, by all accounts. Why do the characters have daft names that rhyme? That suggests they’re likely to just be ciphers. Ah well, it’s only a funny book.